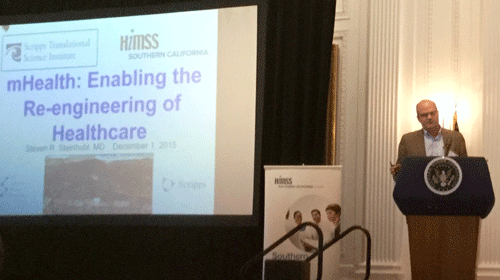 In December, HIMSS SoCal held our 8th Annual CIO Forum “Sustaining Your Competitive Advantage”, at the Richard Nixon Library in Yorba Linda. This always sold-out event featured industry CIO leaders from large, statewide delivery networks, community hospitals, and regional healthcare systems, all focusing on specific growth strategies and creating platforms for innovative growth. Past Chapter President and Assistant Vice President for Scripps Information Services, Clark Kegley, kicked off the conference with his presentation on “Dynamic Integration: When Too Much Innovation is Not Enough”. In addition to sharing an adorable photo of his beautiful granddaughter, Clark’s presentation was extremely insightful in looking at how the advancement of new information technologies has impacted the healthcare industry. In one of his many key points, he emphasized the importance of marrying innovation and technology with an organization’s strategy and goals. As always, Dr. Steven Steinhubl, Director of Digital Medicine at Scripps Translational Science Institute (STSI), brought us significant insight with this presentation on “mHealth: Enabling the Re-engineering of Healthcare”. The STSI group develops the evidence base that show how technologies can influence care with 15 trials now underway. Unique to this group, many of these trials focused on the consumer and outside of healthcare systems. As a clinician, Dr. Steinhubl brings an insightful perspective to mobile health. View his entire presentation on our Chapter’s YouTube Channel. Industry veteran, Jeff Allport, CHCIO, CPHIMS, VP & Chief Information Officer at Valley Presbyterian Hospital , shared with us the Community Hospital perspective with his presentation on “Technology, Partnership, and Care”. The Academic Medical Center perspective was presented by University of California Health CIOs - Michael Pfeffer, MD, CIO, UCLA Health, Chuck Podesta, CIO, UC Irvine Health, and Tom Andriola, VP & Chief Information Officer, UC Office of the President. These Industry leaders teamed up to discuss how UC Health is moving toward a shared IT delivery model to improve costs, extend EMR delivery capabilities and to enable growth beyond their immediate markets. Scott Joslyn, PharmD, Sr. VP and Chief Information Officer with MemorialCare Health System, moderated a stimulating panel discussion on “The CIO Perspective: How IT and the CIO Deliver Strategic Value”. The panel included experts from diverse regional organizations including Jeff Allport, CHCIO, CPHIMS, VP & Chief Information Officer at Valley Presbyterian Hospital, Michael Pfeffer, MD, Chief Information Officer, UCLA Health and Tom Andriola, VP and Chief Information Officer, UC Office of the President. See it now on our Chapter’s YouTube Channel. As evidenced by audience participation, our 8th Annual CIO Forum conference attendees were actively engaged with the sessions and posting on our Chapter’s Social Media channels. Our many thanks to our Programs and Events Team who delivered another outstanding conference! Editor’s Note: This article highlights some of the meaningful content and experiential information shared by our outstanding speakers with our CIO Forum attendees. We are fortunate to be able to continue to share this insightful content with our Chapter members through our video series, available through our Chapter website. We encourage you to take advantage of this important investment your Chapter makes to bring our Members the latest relevant information to help you be successful in your workplace and to enhance your industry knowledge.